The Wolf Tooth Powertrac Chainring works with your biomechanics to achieve optimal efficiency and power with every pedal stroke. Not only will you gain more power, but you will also benefit from greater traction, and less shifting. Wolf Tooth's proprietary design is less ovalized than its competitors, eliminating the funky, uneven pedaling sensation while delivering the optimum pedal stroke. Just like Wolf Tooth's other single speed chainrings, the Powertrac features Drop-Stop tooth profile that holds chain snugly to the chainring. 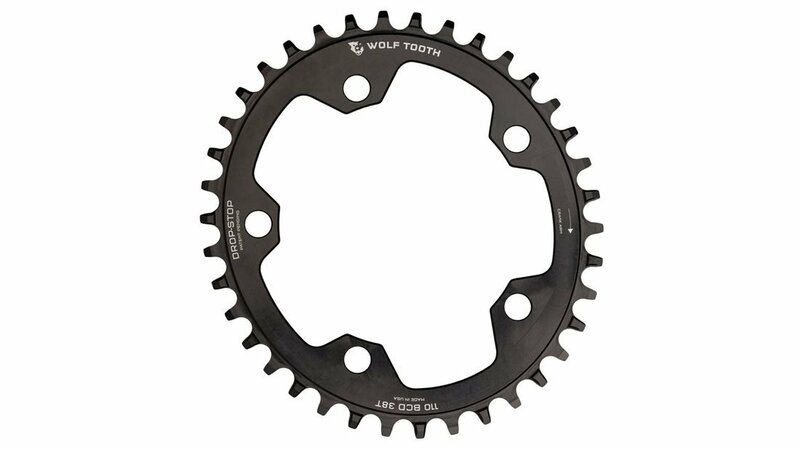 Wolf Tooth offers PowerTrac Elliptical rings in a wide variety of sizes to fit all major brands' cranks. Just pick your size and configuration, order, install, and start pedaling as normal - your new oval rings will do the rest! I threw this on my cross bike and it feels so much better on our hill intensive muddy cross courses. I find it's easier to keep traction on slippery uphills and the torque on the wheel is more even. Never dropped a chain. Definitely recommend. Will this chainring fit my Sram Force 1? BEST ANSWER: Pretty sure it’ll fit Force 1, as long as it’s 110 BCD and 5 volts. . I installed it on my SRAM Red 2x (5 volt 110 BCD) crank to convert it to 1x. Is this narrowwide type ? BEST ANSWER: Yes! Wolftooth calls it Drop-Stop technology. Zoom in on the photo, and you can see the extra thickness on every other tooth.